In the group show “Terra Mater,” or Mother Earth, three Arizona artists bring a haunting quality to their interpretations of the natural world, often contrasting preservation with destruction. In addition, each artist forces a redefinition of beauty through the use of unusual materials or processes. Christopher Colville’s works are semi-representational images obtained through an up-ending of traditional photography. He works under pitch-black skies, setting down gunpowder on photosensitive paper, shooting range-style paper and metal targets that he comes across in the desert. When he ignites the gunpowder, the image emerges unpredictably, with sprays of silver, black and brown. In the works created from bullseye paper targets, there’s a suggestion of atmospheric swirls on distant planets. A work such as “Citizen 8,” though, is more jarring, with the head and torso of the target appearing to be still smoldering. In Michael Lundgren’s “Sun” the photographer gives us a disorienting pinhole view of the sun from inside a lava tube. “The Algaeic Fox” depicts a barely recognizable dead fox that is covered in bluish algae and about to be buried. There’s a surprising poignancy to the scene of decay. Mayme Kratz is known for creating resin panels from desert grasses, seedpods and small animal parts, painstakingly sorted and laid down in majestic arrangements. 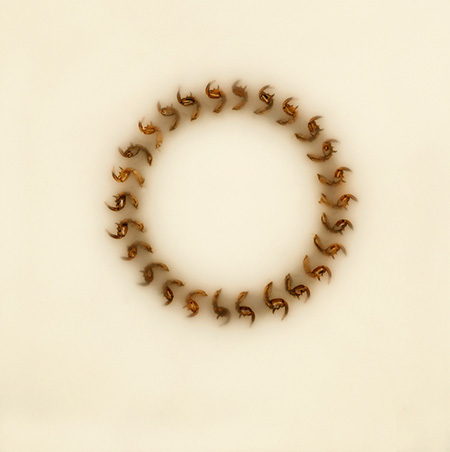 One of the most haunting works here is “Cicada Song,” in which several of the insects have been split open, their remains arranged in a brown wreath that glows from a small ecru panel. She reinterprets beauty.